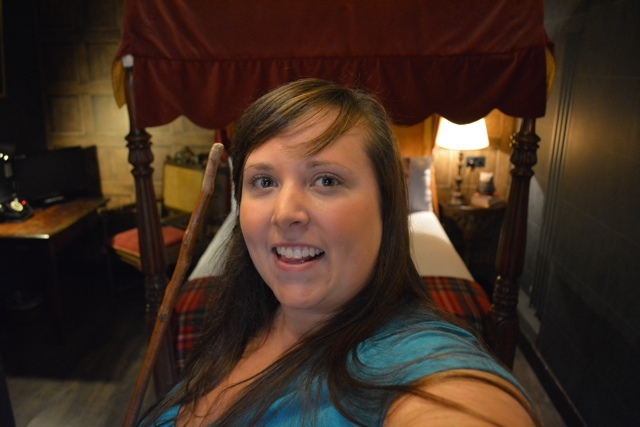 Playing with a wizard wand in a Harry Potter themed room in London…. as you do…. If asked, I would call myself a Harry Potter fan. I wouldn’t go as far as to call myself a Potterhead however as I haven’t really read any of the books, rather I have just seen and own all of the movies and have watched them many times. I have done a walking tour in Edinburgh, Scotland that featured a lot of Harry Potter / J.K. Rowling information like where she wrote the books and the places around the city that inspired her. However I have yet to drink a butter beer, visit the Wizarding World of Harry Potter in Florida, take the Making of Harry Potter Warner Bros. Studio tour in London or do the Muggles Walking tour in London. But they are all on my list of things to do. 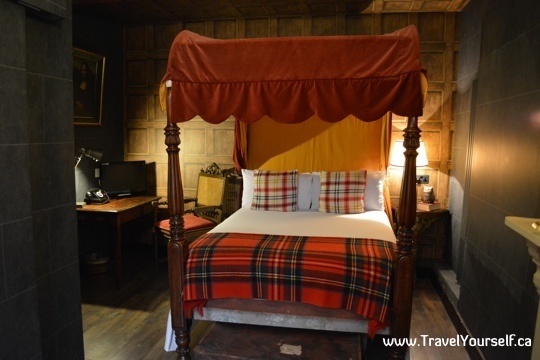 In the past month I have been hearing a lot about the Harry Potter themed wizard chambers hotel rooms in London and since I was visiting there I couldn’t resist checking them out. It was such short notice that I wasn’t able to stay there as the rooms were booked however the Georgian House Hotel did kindly let me into the room in between guests to play with the magic wand and be in awe of all of the decor and unique touches that make these rooms really awesome. Enjoy my video to really experience what these Wizard Chambers hotel rooms are really like. 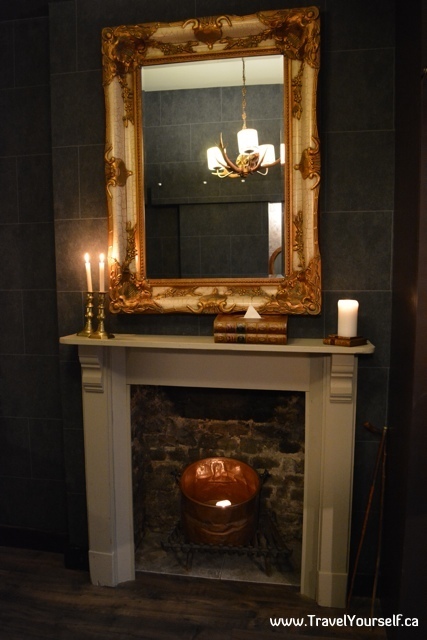 The rooms are located downstairs in the basement of the Georgian House Hotel. As you walk down the candle lit steps you can hear the music from the sound track of the Harry Potter films playing, making it really quite ominous. The first room is a double room for a couple. The room is filled with antique furniture and accents with flickering candles placed all over to give it some atmosphere. 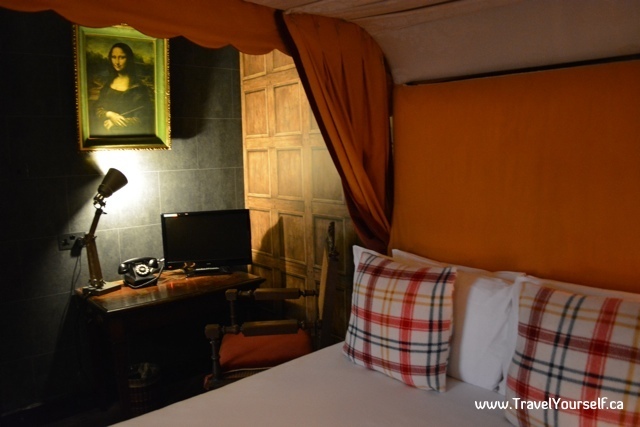 Next to the bed there is a desk space with TV and a Mona Lisa who is always watching over you. 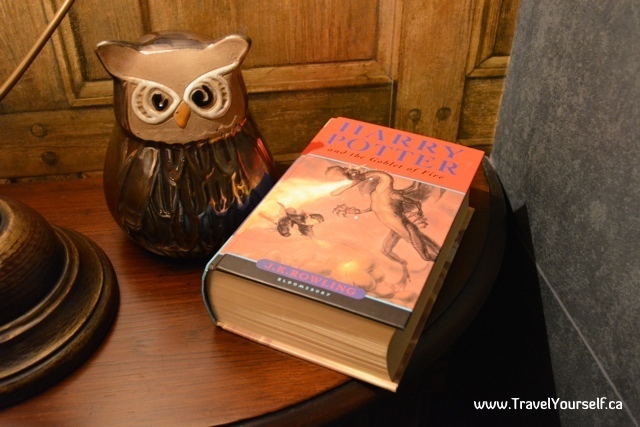 On the nightstand is an owl and a copy of the book, Harry Potter and the Goblet of Fire. The second bedroom is significantly larger with three beds that can sleep up to five people, perfect for a family. 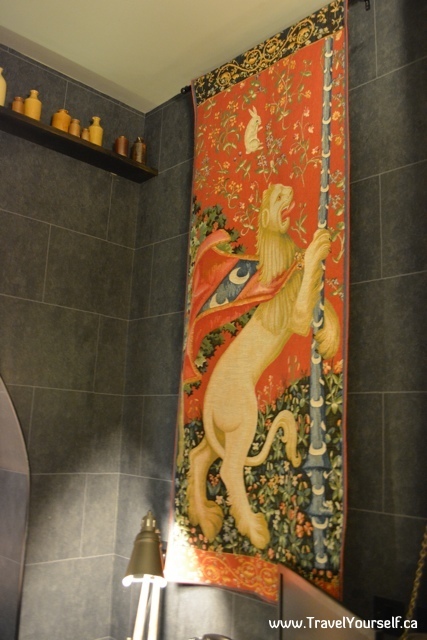 Medicine and potion bottles line the tops of the ceilings and unique tapestries hang from the walls like this Gryffindor-esque tapestry. 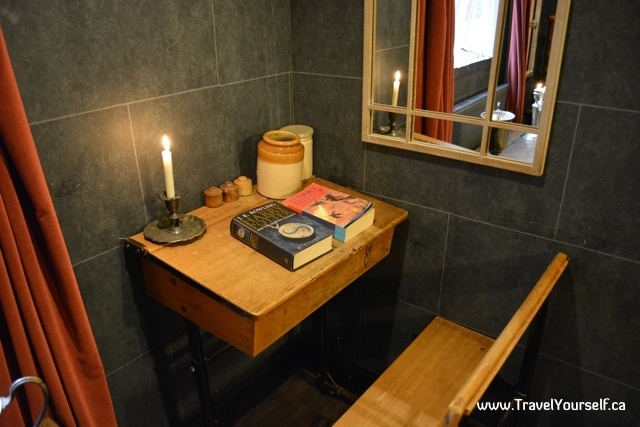 In the corner there is even a school desk with more Harry Potter novels for you to enjoy. 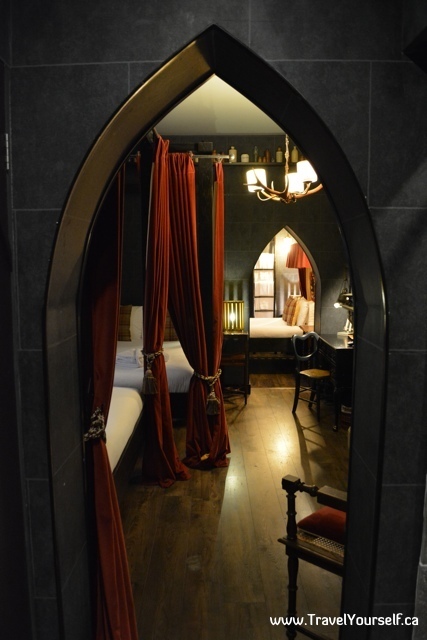 Staying in the Wizard Chambers at the Georgian House Hotel in London would really be a dream for kids who grew up reading the books and even adults who are kids at heart. 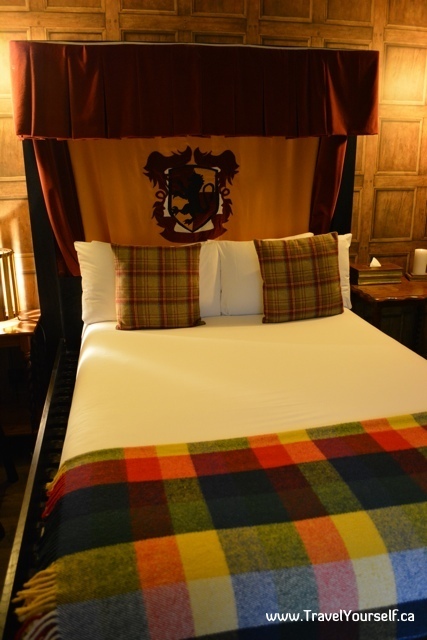 If you are a fan and you plan on visiting London sometime soon I highly recommend you book a stay at Hogwarts… erm the Georgian House Hotel. 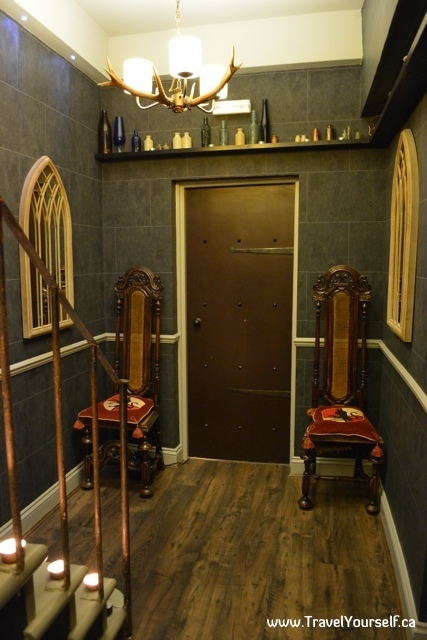 To book your stay in the Harry Potter-esque wizard themed rooms immediately check them out here on Booking.com – Georgian House Hotel, London. Are you a Harry Potter fan? Would you stay here? there’s only gryffindor ? . . . no ravenclaw, hufflepuff of slytherin ??? it physically and emotionally hurts i hope they’re proud jesus christ and it’s such a cool room but nO of cOURSE it’s all about gryffindor you know what i’m gonna go there that way i can add some equality cause this IS NOT OKAY . Oh what fun! 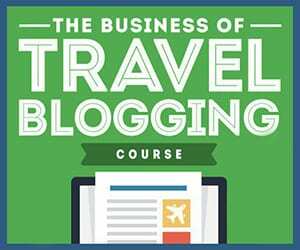 Thanks for adding to my list of things to explore on my next trip to London! There’s also a Harry Potter movie location tour in London that the hotel is partnered with called Muggle Tours :) It’s won a few Tripadvisor awards as well. How much were the rooms to stay in? They look pretty cool! Sounds a dream stay for fans of the book and/or movie …. my sister would go crazy over this! Now that is quite an impressive and interesting hotel. I am really not a Harry fan myself, but I know some people who would love to stay here!